The Line Renderer component takes an array of two or more points in 3D space, and draws a straight line between each one. A single Line Renderer component can therefore be used to draw anything from a simple straight line to a complex spiral. The line is always continuous; if you need to draw two or more completely separate lines, you should use multiple GameObjects, each with its own Line Renderer. Cast Shadows Determines whether the line casts shadows, whether they should be cast from one or both sides of the line, or whether the line should only cast shadows and not otherwise be drawn. See Renderer.shadowCastingMode in the Scripting API reference documentation to learn more. Receive Shadows If enabled, the line receives shadows. Motion Vectors Select the Motion Vector type to use for this Line Renderer. See Renderer.motionVectorGenerationMode in the Scripting API reference documentation to learn more. See in Glossary These properties describe an array of Materials used for rendering the line. The line will be drawn once for each material in the array. See in Glossary here to enable the line to interact with the global illumination system. Positions These properties describe an array of Vector3 points to connect. Use World Space If enabled, the points are considered as world space coordinates, instead of being subject to the transform of the GameObject to which this component is attached. Loop Enable this to connect the first and last positions of the line. This forms a closed loop. Width Define a width value and a curve to control the width of your line at various points between its start and end. The curve is only sampled at each vertex, so its accuracy is limited by the number of vertices present in your line. The overall width of the line is controlled by the width value. 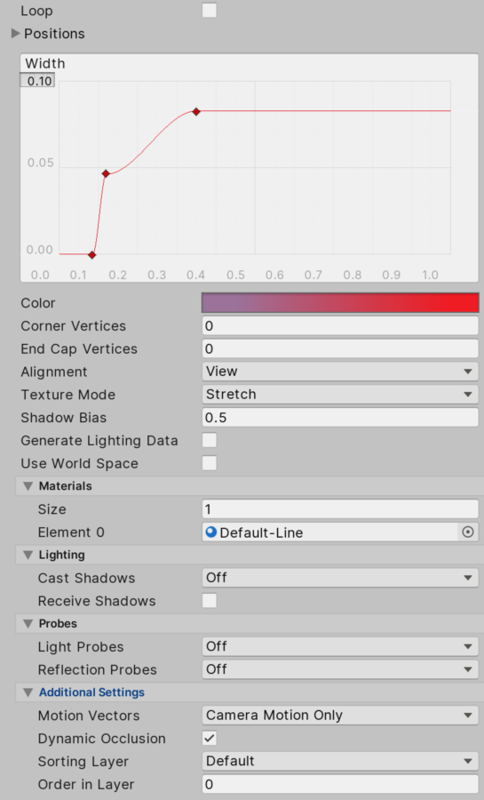 Color Define a gradient to control the color of the line along its length. Corner Vertices This property dictates how many extra vertices are used when drawing corners in a line. 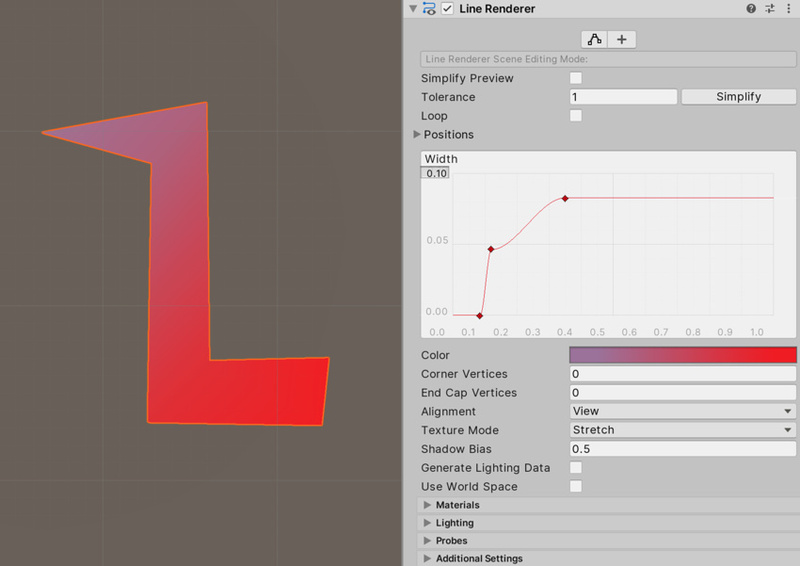 Increase this value to make the line corners appear rounder. End Cap Vertices This property dictates how many extra vertices are used to create end caps on the line. Increase this value to make the line caps appear rounder. Texture Mode Control how the Texture is applied to the line. Use Stretch to apply the Texture Map along the entire length of the line, or use Wrap to make the Texture repeat along the length of the line. Use the Tiling parameters in the Material to control the repeat rate. Shadow Bias Move shadows along the direction of the light to remove shadowing artifacts cused by approximating a volume with billboarded geometry. See in Glossary If enabled and reflection probes are present in the Scene, a reflection Texture is picked for this Line Renderer and set as a built-in Shader uniform variable. Drag a Texture or Material onto the Line Renderer. It looks best if you use a Particle Shader in the Material. Line Renderers are useful for effects where you need to lay out all the vertices in one frame. The lines might appear to rotate as you move the Camera. This is intentional when Alignment is set to View. Set Alignment to Local to disable this. The Line Renderer should be the only Renderer on a GameObject.